George Florance Irby, 6th Baron Boston (1860-1941); (+) Christie's, London, 6 March 1942, lot 62, as 'Marieschi' (65 gns. to the father of the present owner). This set of four pictures may be added to the group of works attributed to the Master of the Langmatt Foundation Views. It is rare to find a set of vedute such as these. The eponymous works in the Langmatt Foundation, Baden comprise a set of nine pictures (each approximately 46 x 73 cm.) and a set of four smaller views (approximately 25 x 38 cm. see the exhibition catalogue, Mythos Venedig, Baden, June-October 1994, pp. 62-117). A further set of six views were sold, Sotheby's, London, 13 December 2001, lot 82. The present set include a view of the Piazza San Marco and the Bacino with the Doge's Palace, both of which were also painted by Canaletto (see W.G. Constable, Canaletto, Oxford, 1976, vol. I figs. 23-7 and 111-5). The two other views, however, are more unusual, and although the Giudecca is depicted in two of the pictures in the Langmatt Foundation, neither takes the viewpoint, as the artist does here, looking West with the Zattere on the right. Another view of the entrance to the Arsenal, albeit seen from the opposite angle, and attributed to the artist, was sold, Christie's, South Kensington, 19 April 2002, lot 199. The present work, however, shows the famous entrance of the Arsenal off to greater advantage, with a more dramatic use of light, and the scuplted lions catching the eye of the elegant passers-by, much as they do today. The provenance of these pictures can, in all probability, be traced back to their purchase by the Hon. Frederick Irby, later 2nd Baron Boston, while he was on the Grand Tour. The family property at Hendsor was purchased in 1764 by William Irby, 1st Lord Boston, who commissioned a new house there, Hedsor Lodge, that was completed in 1778 (by when it had been inherited by Frederick). A contemporary villa of some size, the Lodge was known for its position, described in 1806 in Magna Britannia as standing 'on the brow of a hill, commanding a very beautiful view of the Thames, and some of the most picturesque parts of Berkshire and Buckinghamshire'; the house is recorded in an engraving by J.C. Stadler after Joseph Farington, R.A. in Boydell's History of the Thames (London, 1794-6, p. 274, no. 36). The picture collection at Hedsor seems largely to have comprised inherited family portraits (it was described as containing 'a small collection of pictures, chiefly portraits of the families of Irby and Paget [the maternal and great-grandmaternal family of the 1st Baron]'). This patrimony was, however, augmented during his father's lifetime by a group of paintings acquired on a Grand Tour of 1770-1 by Frederick, who was recommended in a letter of 26 February 1771 to Sir William Hamilton in Naples by the Rev. Thomas Crofts as 'a favourite of all who love modesty & good nature.' 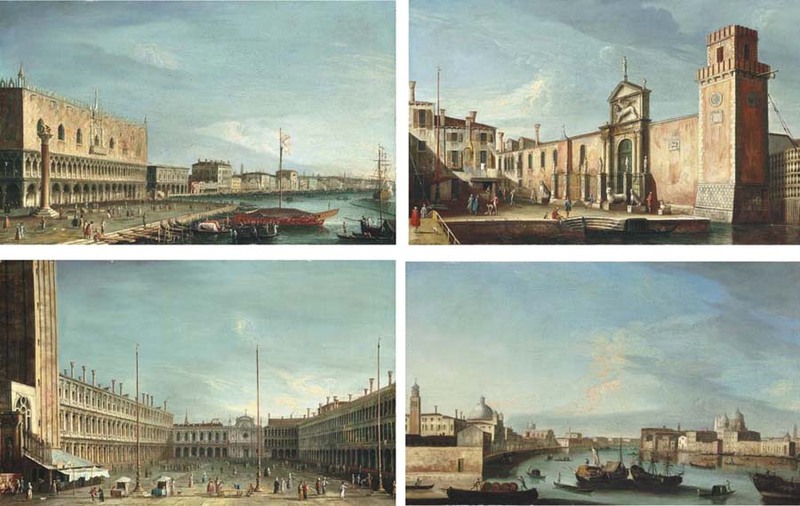 The pictures acquired by Irby included (presumably) the present set, as well as a pair of Canaletto capricci of An Island in the Lagoon with a Pavilion and a Church (Saint Louis, Missouri, Art Museum) and An Island in the Lagoon with a Church and a Column (Washington, private collection).